These terms and conditions are a legally binding contract between you and Canine Champions for Veterans also referred to as “CC4V” (or “our” or “we” or “us”) pertaining to the access and use of the services offered. 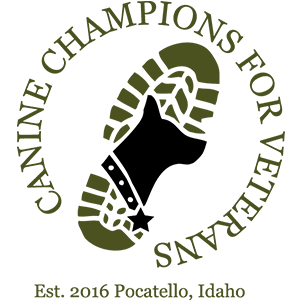 All products, information, content, media, printed materials and online or other electronic documentation accessible from our site at cc4v.org or any subdomains thereof or other sites operated on or behalf of Canine Champions for Veterans. CC4V reserves the right to change or alter the Terms and Conditions any time by reasonable notice, including without limitation by posting revised terms on our sites (which will serve as reasonable notice), and such terms will be binding upon you, the user. The content on the site are provided “as is” for general information only and does not offer warranties of any kind. These materials are not meant to be used for self-diagnosis or to replace the services of any medical professional. Neither CC4V or the site offer medical advice or recommendations to individuals and you should not rely on the posted information of the sites as a substitute for consultations with qualified health care professionals who are trained to work with and recognize individual medical conditions and needs. The CC4V site provides testimonials and additional information, and in certain situations, creates community event pages for fundraising with the purpose of furthering our mission. CC4V may also post articles and other information published by third parties that might be of interest or benefit to the public. You hereby acknowledge that the opinions, viewpoints, and recommendations of third parties contained on those sites are not necessarily CC4V’s, nor are they endorsed by CC4V. Materials from the CC4V site and any subsidiary or affiliate sites of CC4V, may not be copied or distributed, republished, uploaded, posted, or transmitted in any way, without CC4V’s prior written consent. However, you may download copies of the materials for your personal, non-commercial use, provided you do not delete or alter any copyright, trademark, or other proprietary notices. Modification or use of the materials in other manner violates CC4V’s intellectual property rights. The material on all of CC4V’s sites is provided for lawful purposes only. If you download files, including, but not limited to images, printed materials, logos, icons, content, text, graphics, audio/visual clips and/or design neither title nor intellectual property rights are transferred to you, but remain with CC4V, who owns full and complete title. You may not resell, decompile, reverse engineer, disassemble, or otherwise convert content from CC4V’s sites. Any unauthorized use of the materials contained on CC4V’s sites may violate copyright, trademark, and other laws. CC4V does not accept liability from any sponsors or affiliates’ actions. CC4V may from time to time acknowledge certain persons, organizations, or companies who have provided donations or sponsorships to further our mission. This may be done in a manner where names, marks, or links to their individual sites would be used. CC4V does not solicit or permit the purchase or use of advertisements or commercial endorsements on the CC4V sites by any person or company (including, without limitation, its sponsors and donors). If you choose to click on the links to any of our sponsors’ websites or otherwise engage in any correspondence or business dealings with or other purchase of products or services from any of our sponsors, you do so on your own initiative and you agree that CC4V won’t be held responsible or liable for any loss or damages of any sort incurred as a result of any such dealings or as a result of the acknowledgement of or links to such sponsors in conjunction with CC4V’s sites. CC4V may provide links to other websites or resources. The information provided to you in these links is provided solely for your own individual information. The results are not guaranteed to be accurate and are in no way endorsed, offered, or guaranteed by CC4V. You should be aware that links to CC4V’s sites may be provided from other sites, either known or unknown to CC4V, and some links to the sites may be unauthorized, and accessing any other site linked to or from CC4V’s sites is done at your own risk. CC4V has not reviewed and is not responsible for the content of any third party sites linked to or from CC4V’s own sites. CC4V gathers personal information such as first and last name, email address, mailing address, phone number, credit card or debit card, and other account-related information only submitted by you. If you make a donation or apply to our program, personal information will be collected in order to process your donation and/or application. With your permission, CC4V will use your personal information collected from you to send you information, such as CC4V program updates, application and attendance updates, fundraising campaigns or major grant initiatives. If you choose not to receive such materials, we will not send them to you. When you visit CC4V’s sites or any subdomain operated by CC4V, we automatically collect information about your visit. Collecting this information helps us to improve our sites to enhance your user experience. Aggregate information is non-personally identifiable/anonymous information about you, such as web pages you frequently visit, time spent on a page or area if on the CC4V site, the number of visits to the CC4V site by you, type of browser you used, cookie preferences or search terms entered by you. CC4V can tell the type of computer you are using, as well as the date, time, and pages you visit. This information is used in a collective manner, and no single person can be identified by that compiled information. Aggregate Information may also be used for internal purposes, such as tracking demographic data and providing targeted content to make our sites more useful to visitors. This type of information is non-personally identifiable, anonymous information about you, such as pages you frequent most (on CC4V’s sites), time spent on a page or area of the CC4V site, the number of visits to the CC4V site by you individually, types of web browser you used, cookie preferences or search terms that you entered, as well as the date and time that you visited. Aggregate Information is used in a collective manner, and no single person can be identified by that compiled information. CC4V respects the privacy and confidentiality of all donors and benefactors and will not release personal information including names, addresses, phone numbers, email addresses to any outside charity or organization for the purposes of solicitation. CC4V will not publish pictures or the names of donors or benefactors on the website or in other publications such as brochures, newsletters, press releases or other media without the express written permission from the donor, benefactor, or their parent/legal guardian if the donor or benefactor is under the age of 18. The personal information collected will be used to provide written substantiation to donors and/or benefactors. CC4V uses NeonCRM products and services to process donations made through this site. CC4V does not sell, transfer, or disclose personal information to third parties. CC4V reserves the right to use or disclose and information to satisfy law, regulation or legal request, to protect the CC4V sites’ integrity, to fulfill your requests, or to cooperate in any law enforcement investigation or an investigation on a public safety manner. CC4V uses services such as Google Analytics, among other third party vendors that place first party and/or third party cookies on a browser across our CC4V sites. To opt out of Google tracking, please visit their Privacy & Terms page. We also use Google AdWords “remarketing” to market our CC4V sites across the web. We place a cookie on a browser, and then Google reads these cookies and may serve an ad on a third party site. You may opt out of this ad serving on Google’s opt out page. In order to review any personal information we have about you or to ask us to delete that information or to stop further use of the information, please contact us through the mailing address above. If you would like to unsubscribe from our email list, please use the safe-unsubscribe link at the bottom of our newsletter emails or contact us through the postal address listed above. It may take up to a month to remove you from all of our correspondence, if we have one in production when you request to be removed. This website provides links to other sites that are not operated by CC4V. If you visit these linked sites operated by third parties, you should review their privacy and other policies. CC4V is not responsible for the policies and practices of third party companies.